Sharing Your Lens - Lens Studio by Snap Inc. This guide walks through best practices for sharing your Lenses to the world! One of the best ways to share a Lens is to take a Snap of you or your friends using the Lens. This allows users to see a preview of the Lens and also hints at how to use the experience. When posting to Your Story or Our Story, Snapchatters are able to unlock the Lens by swiping up. It's great to say Swipe up to unlock the Lens in your Snap or use the Swipe Up sticker! Overlaying the Snapcode on a video of the Lens being used is one of the most effective ways to share your Lens outside of Snapchat. This should always be paired with the Lens link in the post's description or comments section. While you can use video editing tools like After Effects to overlay the Snapcode over a video, you can also do this directly using Snapchat. Follow the below steps to overlay your Snapcode over a Snap. 7. Take a fun Snap using the Lens! You now have a Snap with an overlaid Snapcode that you can export and post anywhere online! 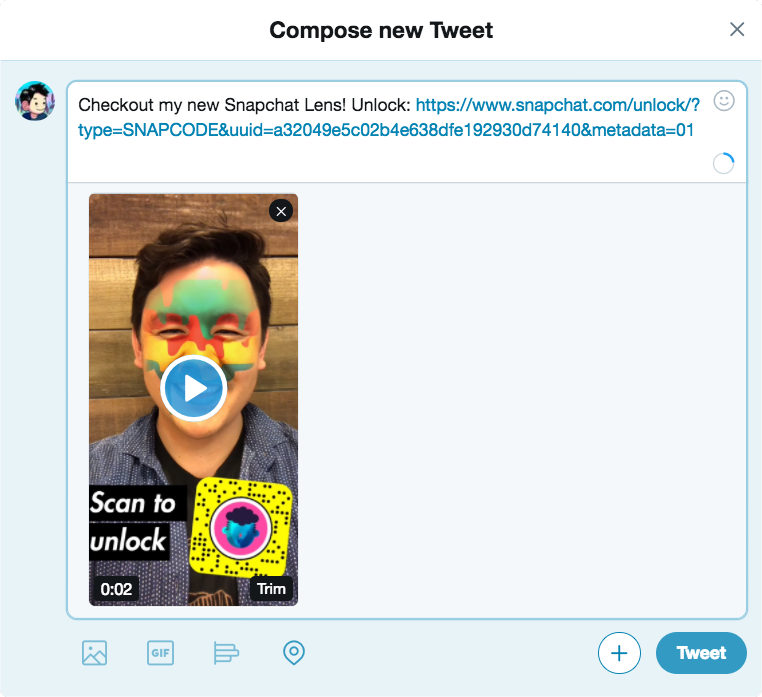 Now that you have a Snap with an overlaid Snapcode, you're ready to post your video! Export the Snap from Snapchat and post the video online. Make sure to include your Lens link in the description of the post or in the comment section wherever you are posting. Always make sure your post includes the Lens link in the description or comment section!